A bit nonplussed with the McLaren MP4-12C? 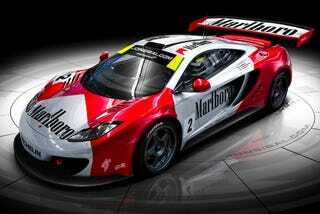 These photoshops of the new car wearing the McLaren F1 GTR's classic racing liveries should fix that. The problem with the new McLaren doesn't just appear to be the baffling name, but the apparent lack of headline performance figures amid the inarguable impressive level of technology. Remember, when it was released in 1992, it was, by far, the fastest road-legal car ever made, hitting 240 MPH. In fact, since cars like the Bugatti Veyron and SSC Ultimate Aero TT use forced induction, the F1 remains the fastest naturally aspirated car ever. The MP4? It should hit 200 MPH and will likely be more a rival for the Lamborghini Gallardo and Ferrari 458 Italia than it will ultra high-end hyper cars.